Salt Lake City may become the first city in the nation to offer a 30-dollar-a-month transit pass for every resident. 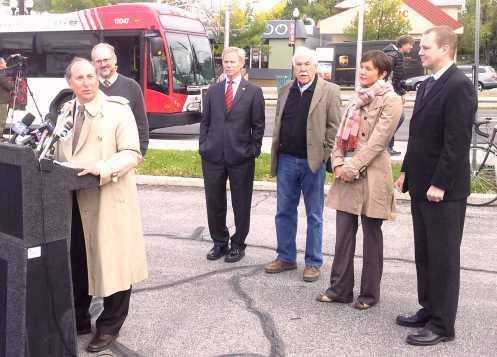 Mayor Ralph Becker says the initiative designed to improve air quality is a complex agreement between the city and Utah Transit Authority, he hopes will be simple for residents to access if it’s approved by the city council. Stan Penfold is the councilman who brought the proposal before the council. He says what people want are options for getting out of their cars. “And this is a huge step in providing options for anybody who lives in Salt Lake City with a really easy and convenient opportunity to take transit instead of taking their car," says Penfold. The pilot program has UTA covering the 60 dollar balance of the 90 dollar retail cost of the pass, the same way it handles the Eco Pass with large businesses and learning institutions. The city would pay the estimated 150-thousand dollars in annual administration fees. City Councilman Kyle LaMalfa represents District 2. He says with enough participation the transit pass will eventually become revenue neutral. “What the administration has done is totally aligned with the city council priority on transportation and aligned with our goals of a transportation master plan for the city that’s transit oriented,” says LaMalfa. The pass would be paid along with the monthly city utility bill. The proposed program is expected to be on the agenda at next the city council meeting on Tuesday. If approved, the new program could be operating as early as January next year.